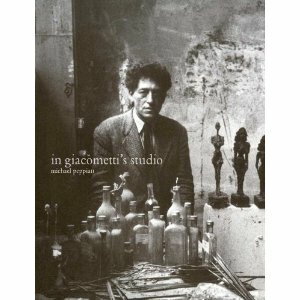 In Giacometti's Studio is a new book by the leading authority on the artist, Michael Peppiatt. The book has been published to coincide with an exhibtion at the Eykyn Maclean gallery in New York. Eykyn Maclean was set up in 2006 by Christopher Eykyn and Nicholas Maclean, to exhibit musem quality 19th and 20th century art. The pair had previously been co-heads of the Impressionist and Modern art department at Christie's and so we well placed to take on such a venture. In Giacometti's Studio: An Intimate Portrait will run until 18th December, and is the first public exhibition to be held at the gallery and the works on show are not for sale. Around 100 sculptures, paintings and drawings are on show thanks to a generous loan from the Giacometti family. The exhibition, and the book, take a look at the tiny studio that Alberto Giacometti inhabited behind Montparnasse, in the last four decades of his life, churning our creations based on his views of mankind. The book charts the life of the studio from the time that Giacometti and his brother arrived in 1927, with their possessions in a wheelbarrow, until Giacometti's death in 1966. The book both gives an in-depth look at Giacometti's life in those years within his hub of creativity, but also sheds light on the influences and experiences that shaped his artwork. Peppiatt came close to meeting Giacometti, through his relationship with Francis Bacon, but that meeting was never to be, with Giacometti dying not long before. Regardless, Peppiatt got to know the people in Giacometti's world, and through those relationships he has managed to create a key book on the life of Alberto Giacometti.